Fundraiser by Sosefina Atelea Tau Pita : Heart 4 Ati Tau "Together We Beat"
Heart 4 Ati Tau "Together We Beat"
On Thursday, February 20, 2014, Ati was scheduled for a small procedure to remove a polyp from his nose. While preparing for the procedure, Ati had a sudden cardiac arrest, saved by CPR and immedeiately went into a COMA. Maui Memorial determined he must be airlifted to Queen's Medical Center, Honolulu for intensive cardiac care. Once he arrived at Queen's he had another sudden cardiac arrest and urgently was operated on to insert an electronic device called Impella. He is now dependent on that temporary machine to pump his heart. His medical team say his case is unusual. He arrived Queen's Medical Center with a less than 5% of his heart working. 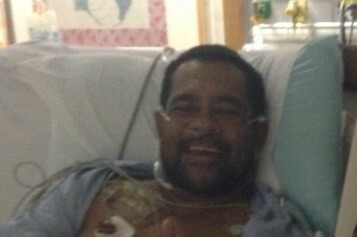 Today, he's breathing on his own, smiling and talking but dependent on the Impella which is temporary. Queens cardiac medical team recommended Ati for a heart transplant at Stanford University and was accpeted. Due to the type of critical care Ati requires, he must be transported by air ambulance with critical care staff on flight. Ati has medical insurance through his wife, Ofa's employer sponsored insurance with Home Depot. Hawaii Medical Service Association (HMSA) denied to cover his air ambulance transportation because it's not a covered benefit. We aren't giving up and doing everything we can to get Ati to Stanford. His medical team submitted a request to make a special exception due to his unusual situation. We've requested Hawaii's Congresswoman Tulsi Gabbard to intervene to help expedite the process. We're not asking for a free ride to Stanford, just help from his insurance company. How many people in the State of Hawaii know that heart transplants are not an option and consider selecting a health plan that 'includes' long distance air ambulance benefits? Our ask of HMSA is to look past the price tag for Ati's transportation and see that he's asking for Life and not a denied claim, stamped and filed into a cabinet. Time isn't in Ati's favor and we can't wait on HMSA to hopefully reconsider. This fundraising campaign is to help pay specifically for his transportation from Queen's Medical Center, Honolulu, Hawaii to Stanford Hospital, Palo Alto, California within the next 48 hours. Heart 4 Ati Tau "Together We Beat "
Ati will not be in the condition for visitors immediately upon his arrival but know that you will be able to visit him as soon as he's able to. I already invision some camping at Stanford to see him LOL but please understand that too much excitement triggers his heart to race. (hmmm seurity guard at his door?) I tell you, only Ati! I continue to receive requests from Ati's family and friends on how they can donate. Instead of asking people to send me their donation by mail, I've turned on the ability to continue to receive donations. Ati, wife Ofa and kids live in Maui. They will relocate to California to be close to Stanford. Any donations received will go towards supporting their journey. Thank you everyone for your generosity! Due to reduced price from the air ambulance, we've met our goal!!!! God Bless you all! From my ohana to yours...me ka Aloha kekoa! With the amount of donations received today, you should reach out to the hospital about negotiating a lesser cost for the air ambulance. Many times when paid in full, they will reduce the cost of transport. They did for me. The prayer group from Stephen Ministries is doing a group prayer for you tonight, God Bless! Sending all our love and prayers to you and your family from ours. Hoping for the best god is good!! Stay strong stay blessed.. Ofa lahi atu ka koe! I'm so glad this much has been raised and am grateful to everyone for it. You have been in our prayers. Please stay strong! We are praying for you and sharing your need. I wish I could help more. My son needed to take a Air Ride transportation fro a little hospital in Barstow California to Loma Linda as he was on a respirator & very ill. Thank God the insurance took care of the helicopter ride. Mercy flights was great to him. Without them He would have died. Hes Only 39yrs when this happened. We truly are praying for you. Praying for you uso Ati and family. You're a strong minded person and I know that from experience. You work hard for your family even when the world throws obstacles at you. Keep that fighting spirit up and will be praying for you all the way from Samoa. Wow, This is a very humbling experience to see friends, family and even strangers to Ati show so much love and support. I am so grateful for all of you I don't know how to explain just how grateful. THANK YOU EVERYONE!!! God bless. We are praying for you. Alofas to your family. Stay Blessed! The Parishioners and Staff of St. Theresa Church send their love and prayers to you and your family. Continue to be strong and trust in the Lord. We pray for you often. Know that all of you and Ati continue to be in our thougths and prayers here at St. Theresa Church. Will always be blessed to know the Tau family. Even though the road is long ahead, So many friends, old an new, will always be here to help you along the way.